Choose from the wide range of Chalk Board with Shelfs by Exclusive Furniture World. 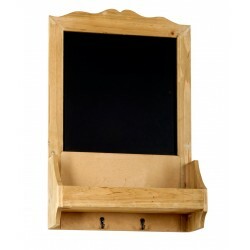 Attractive and useful blackboard with wooden surround incorporating a shelf at the bottom. Constru..
Weekly planner perfect for writing down notes, lists and for planning your week. Features ‘Thi..
Wholesale Chalkboard with hooks and Post Space 47 x 10 x 59cm. Manufacturers product code: N0147. M..
Wholesale Vintage Chalkboard with Hooks 64 x 8 x 71 cm.Measures: 64 x 8 x 71 cm Sold wood chalkboard..
Blue tone wooden chalkboard in a traditional design. Comes with a chalkboard ideal for writing messa..